After escaping the Russian gulag, Rob and Akiva’s cable guy hooked up their TV’s with illegal cable so they could re-watch the next episode in the Seinfeld series for their weekly post show recap. This week, they discussed season two’s “The Baby Shower”, which aired May 16th, 1991. Rob referred to this episode as one in the “awkward teenage years” of the Seinfeld series, with some of the more legendary episodes just right around the corner. In his notes about the episode, Akiva shared how writer Larry Charles, along with co-creator Larry David discussed how this was the first episode that they intended to intertwine the storylines all together. He also read an article recently in the New York Post about how Friends was a more influential show to today’s TV than Seinfeld, though the writer of the article proclaims Seinfeld as the better show. 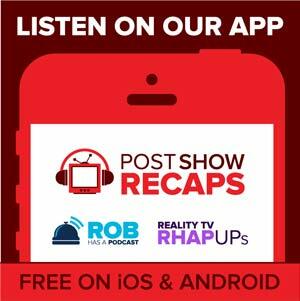 No need to add Friends to the list of shows for Rob and Akiva to recap after Seinfeld, since Akiva hated Friends. Rob enjoyed it during its run, but wouldn’t re-watch it now. In the opening credits standup, Jerry does a routine that loosely ties into the episode about how the remote control offers us a good glimpse at the difference between men and women by how they browse through the channels. Men being the hunters, flip through rapidly, while women as the gatherers, stop on each show to see what it’s about. Akiva had an interesting note about how typically the writer of the episode will write Jerry’s standup that appears in the show, but Larry Charles didn’t consider it his strong suit, so he had Jerry write it. The first scene of the episode has Jerry, Elaine and George chatting at Monk’s Diner. Elaine is talking about having to throw a baby shower for an old college friend named Leslie, who has married a Kennedy. Rob pointed out how the Seinfeld writers have had an infatuation with making Kennedy jokes and references throughout the series. George shares how he once went on a terrible date with Leslie, where she invited him to her one-woman show she was performing about cooking dinner for God. She subsequently dumped a can of chocolate Bosco sauce on his brand new shirt as part of the show. George wanted to confront her about this after the show, but was a “groveling little worm” due to her being so intimidating. Elaine can’t throw the shower at her apartment because her roommate has Lyme disease. Jerry thought she had the Epstein-Barr virus, and Elaine confirms that she does, but with a “twist” of Lyme disease, a joke Akiva quite enjoyed. She gets Jerry to agree to have the baby shower at his apartment while he’s gone to a show during the weekend. Meanwhile, George is getter madder and madder rehashing how Leslie spurned him so many years ago. He wants to one day confront her about it. Akiva shared a story about a distant relative he wanted to tell off one day himself. He was recently given the opportunity to do so, but, like George, pulled the groveling worm routine. The scene ends with George storming out, but not before removing one of the dollars from the tip he leaves. Akiva and Rob remark that they always enjoy the quick jokes about George’s cheapness. The next scene is back at Jerry’s apartment, where he is trying to get TV reception with some rudimentary rabbit ears. Kramer comes in badgering Jerry to let his shady Russian friend hook up illegal cable for only $150. After much protest from Jerry about it being against the law, Jerry gives in when Kramer informs him that the Mets will have 75 games on cable this year. Rob and Akiva loved the dated reference of Kramer when he tells Jerry “Come on, it’s the 90s, it’s Hammer Time!”. Referred to by Rob and Akiva as the craziest thing to ever happen on Seinfeld, the next scene is a dream sequence of Jerry’s. He returns home from his trip to see a group of FBI agents in his apartment, waiting to bust him for the illegal cable. Kramer is there, and has sold Jerry out. When Jerry tries to tell them they’re just patsies, the Russian cable guy appears, but is actually an undercover FBI agent, leading the sting. When Jerry tries to make a run for it, the FBI guys gun him down in horrific fashion. Akiva mentioned that in the notes of the show, writer Larry Charles said he wanted this scene to be Tarantino-esque. Jerry wakes up from the dream and is on his flight to Buffalo for a gig. As he does, the plane is preparing for an emergency landing because of a blizzard. When he arrives back at the airport, George picks him up, and Jerry goes on about how appreciative he is for this. When George keeps making excuses of why they should go back to Jerry’s place instead of out to eat or George’s, Jerry notices that George has the Bosco stained shirt on under a sweater, and is planning on confronting Leslie, who is at Jerry’s apartment for the baby shower. Rob pointed out that George would later use the word Bosco for his ATM pin. He wonders why, since George had such a negative experience being doused by Bosco by Leslie. Back in Jerry’s apartment at the baby shower, Leslie is being rude to Elaine about the quality of the food, while Elaine tries to no end to impress Leslie with talk of the Kennedys. Kramer bursts in with the Russian cable guy, as they have to install the illegal cable right now during the party. Jerry and George are meanwhile downstairs arguing over going up and disrupting the party. When Jerry asks George what he’ll even say to Leslie, George dives into a heated diatribe of how rude and insulting she was to ruin his shirt, and to not even have the decency to call him again. Jerry scoffs, telling him he’ll never say that to her. Upstairs, Kramer is chatting with some of the lady guests about how he eats the whole apple, including stems and seeds. Elaine complains to him about how the cable guy is eating all the food. Kramer makes up a story about how in Russia, the cable guy is treated as king of the house, and it’s customary to let him do whatever he wants. Jerry and George make their way into the party, and Elaine immediately spots George wearing the stained shirt, so she warns him against making a scene. But George takes off the sweater and marches up to Leslie to confront her. Leslie dismisses him, not recognizing who he is. This intimidates George into reverting right back to the groveling worm. Just as George is wilting under the intimidation, a woman from the party confronts Jerry about how they went out long ago, and he blew her off. She lashes out at him in the manner George had wished to lash out at Leslie. Rob shared a story about a person who got quite nasty with him once because he said “nice to meet you”, when they had apparently already met, and the person threatened to spit in his face. As the lady who confronted Jerry storms away, she bumps Leslie, whose cake plops right onto George’s already stained shirt. Despite all this, she has George schlep her gifts down to the street for her. As she leaves, she gives Elaine a backhanded compliment about how she hasn’t changed since college, giving her an insincere thank you. Akiva thought that the Leslie character wins the award for the most despicable character so far in the episodes they’ve reviewed, even more so than Rava. After everyone leaves, Jerry tells the cable guy to forget the illegal cable, and tries to settle up the bill. He tells Jerry it will be $400 ($700 in 2014 per the inflation calculator), which Jerry says he won’t pay, since Kramer told him it would be $150. In the epilogue scene, Jerry, George and Elaine are sitting on the couch trying to get reception on the TV that now also has a huge crack in the middle of it from the Russian cable guy. The standup in the closing credits is a bit longer than usual, with Jerry talking about trying to get out of seeing someone again that you’re not interested in, which Rob and Akiva agreed it is much easier to do nowadays by saying you’ll Facebook or text them. The guys felt like “The Baby Shower” would hold up pretty well for the most part in 2014. Only the television with rabbit-ears and the whole idea of stealing illegal cable seemed dated. Nowadays, so much content is available in a “semi-legal” way via the internet, so the need to descramble channels is not there. There were only a few pieces in the mailbag this week. Eddie Mac offered the correct pronunciation of the actress playing Elaine’s roommate. Phonetically, it’s SHE-VON, an Irish name. Johnny emailed them wondering when it is that George ends up living back with his parents. Rob and Akiva both confirm that it’s the plot of an upcoming episode. 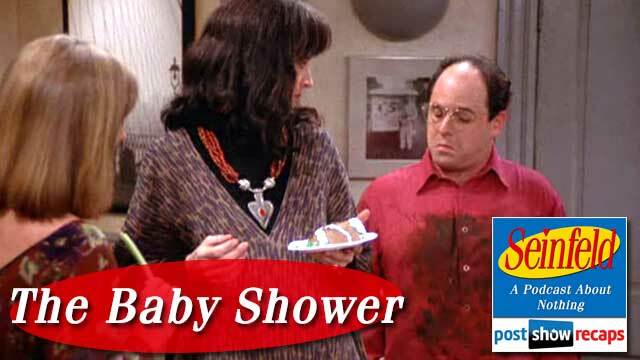 Both felt that “The Baby Shower” would rank toward the bottom of the episodes covered so far, though they agreed that there was a lot of classic George moments that highlight how he is always ruining things or blowing it for himself. Tune in next week as Akiva and Rob will breakdown “The Chinese Restaurant”, which they both agree is top 25-worthy. Rob encouraged the listeners to respond to his question of the week. This week’s question is, “Does George pick Bosco as his ATM pin later in the series because of Leslie dumping the can of Bosco on him, or in spite of it”? You can give your answer to the question of the week in the comment section atpostshowrecaps.com/Seinfeld. While there, you can subscribe to the podcast on iTunes. You can also send your questions or comments to[email protected]. Don’t forget to follow them on twitter @robcesternino and @keev26. Special Thanks to Mike Moore for this week’s episode recap!